This is my first experience with being tagged! Thanks, Amy, for thinking of me! 5 years ago: I was adjusting to new mommy-hood. Olivia was born at the beginning of January. I think tv was cut out of my life for a little bit, as I found new entertainment in watching Miss Liv's every expression....at least until AI came on the air. 3 years ago: Would ya beleive I was pregnant? Sam was busily kicking the crud outta my sides, ribs, back, you get the picture. It seems he was testing the walls that were holding him in, looking for an escape. Oh, MAN! He was a painful child to carry! 1 year ago: HMMMM, let's see. Prego. Let me just clarify that i haven't spent the entirety of my marriage this way....only half of it. Oh, Emerson. I actually liked being pregnant with her. She kicked a lot, but not like she was trying to stick her foot through my side. So far this year: I have been released from my job in the Young Women and thrown into jail...I mean Nursery, celebrated 2 birthdays, watched my baby girl grow up too fast, cleaned up many Sambo and Olivia messes, pulled the food Sam feeds Emers out of her mouth (Well, Mom, don't you think she wants to try a conversation heart, too??? ), and missed the parts of my dear family that doesn't live in Colorady. Yesterday: I got up at 4:30 to go to the gym. I ate a bowl of Cheerios. I got the kids ready for the day. Took Liv to preschool, hung a little shelf up in my bathroom, picked Olive up from school, ate a nutrtious lunbch of left over Little Caesar's, watched my nephews, ate hot chicken salad (ala Aaron), went visiting teaching, went to singing group, came home cleaned a bit, watched the girls of AI (I love Brooke), went to bed, hit Aaron for snoring. Today: I woke up at 4:30 to go to the gym: elliptical, treadmill, and stairs today, ate some tasty Apple Jacks, I'm babysitting Aislinn, I fed Emerson a few times. I have been cleaning my bedroom. I've yawned a lot. Trying to figure out why my legs aren't wanting to work with me. Later tonight: Temple Recommend Interview, Idol results, and (hopefully) an early bed time. Tomorrow: Rinse, Lather, REPEAT. Tomorrow I will be working my legs at the gym....with weights, I mean. Preschool, possibly watching Aislinn. Hopefully having a movie night with Aaron. This year I hope to: Be the Biggest Loser: Sista Edition (no worries, girls, I'm currently on track to be the Biggest Gainer), grow some patience for my wee tots, see my family, be better at mommy/wife stuff, read the BOM, read Breaking Dawn, watch David A win Idol. And, I think I want to end by saying: "Erika & Meredith, TAG YOU'RE IT!!!" Ummmm, from my fab sis in law Ursula!! 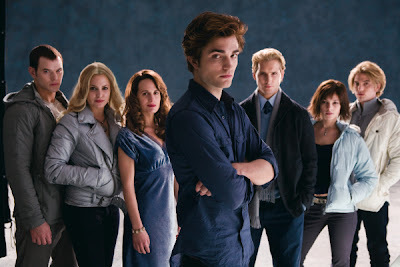 Not only that, but let the count down to August 2 (Breaking Dawn release) and December 12 (movie release) begin!!!! I totally should have typed this one up yesterday, but better a day late than never, I suppose! So, it was Februaury 13, 1999. A Saturday. I went country dancing in Pleasant Grove with Mindi Taylor. All of my guy friends were in Colorado teaching country dancing to a group of people. I therefore set out dancing. And flirting shamelessly. I asked a few fellas to be my Valentine, nothing wrong with having back ups, right? Well, the two names I remember from these Valentines are Eric and Aaron. I happened to be dancing with Aaron on the last dance, slow dancing in the middle of the floor, not two steppin' around the outside. There was a couple dancing fairly close to us...they were obviously Valentine's as they were making out pretty good. I observed, "Oh, look. She gets a kiss from her Valentine." My very astute dance partner said, "We could share a little kiss, if you'd like." So we did. Shortly after the dance ended, I found Mindi to go head off to our usual breakfast-after-dancing-at-Village Inn, to which Eric (the other Valentine) had asked to come. Aaron approached and, in front of Mindi and Eric, asked me if I'd like to go to breakfast. I answered that I already had plans, but he was still my favorite Valentine. Eric looked at Aaron and said, "You're her Valentine, too?" OOPS! Well, to this day, he's STILL my favorite Valentine. Before I asked him to be my Valentine, I was on his list of snobby girls. My actions of this night led to him thinking I was okay enough to hitch. So, while not something I would recommend to any of my dear nieces, IT WORKED FOR ME!!!! I love this guy. He's about the oneriest turd I've met, but I can be less than sweet on occassion, too. He's a great dad. He works hard to provide for us. He makes me laugh. My only complaint? I have had a heck of a time getting him to take me dancing! My Barbie Princess Fairy Cowgirl. I'm just sitting here thinking. 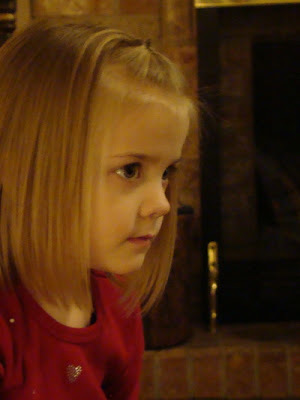 This little girl turned 5. Not possible for at least 2 reasons, #1 I'm not nearly old enough to have a Kindergartener, and #2 It can't possibly have been 5 years since I first laid eyes on my little Olivia. It's just not possible! 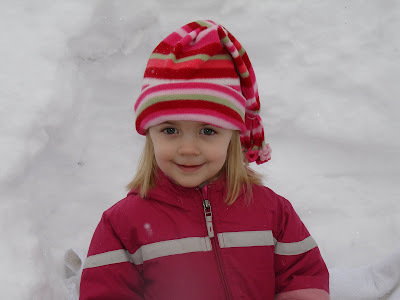 Olivia is so smart, and cute, and sweet, and her imagiantion is so much fun to watch and listen to, and some of the things she does and says keep me on my toes. I have a few of my favorite "Olivia Moments" I'd like to share with you. We were driving to Grandma and Grandpa's house, Olivia was a few months shy of turning 3. She sat in her car seat, being unusually quiet when she let us into that little mind of hers, "Dad, dogs have tails and cats have tails." This sparked a conversation on what other animals did and did not have tails. Monkeys, yes. Sharks, no. I turned around and asked, "Olivia, do you have a tail?" She took a moment to think, "No! I have a bum!" The day came when I was able to inform Olivia that I was pregnant with baby #3. I told her there was a baby in my tummy. She got the cutest little confused look on her face and said, "Are you sure?" I told her that I was sure. She then started planning her life with a new sister, i had the sad job of informing her that we didn't know if it was a sister or another brother. "Let's just call it a girl. "she said. Olivia was quite sure from early on that she was getting a girl sister and not a girl brother. Same week I was reading the Book of Mormon with her. She was quite inqusitive about what a record was, what wicked was, and what destroy meant. I finished reading and went over what we had talked about with her. "Olivia, what does wicked mean?" Answer: "It means you don't get any treats." There's also a very fun Laban story, a bit too long for this post. Olivia loves to make new friends. When we go to the playground, when we go to McDonald's and this paticular time when we went to Target during the Christmas rush. "Mom, maybe I can make a new friend today!" I tried to explain that this wasn't a play place and that most everyone would be rushing. That, however, failed to deter my daughter. We were walking hand in hand when a family that looked mid-eastern to me passed by going the opposite direction. They had a little girl about Olivia's size. 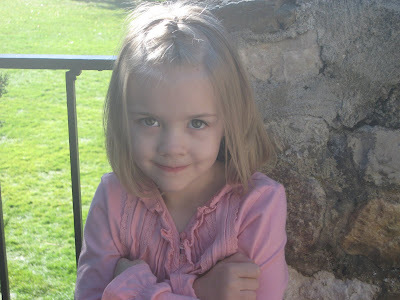 Olivia looked at her, waved, smiled sweetly, and said....."Hola!" i started walking faster....and tried not to laugh too loud. What can I say about Olivia? She is my favorite oldest daughter. she is the cutest Olivia I know. She is a sometimes more than others patient sister to Sam. She is a mostly gentle older sister to Emerson. She is sweet, and onery, and fun, and lovely. I love her to pieces. I want her to stay small. She, however, informs me she needs to get big so she can be a mommy, too. Not so fast, my dear... let's just try getting through preschool first. What do you get if you take one boy from the West, add a girl from a neighboring state, and then throw in a little smarty pants girl, a whirlwind of a boy, and a dramatic toddler? That's my life in a nut shell! Hope you enjoy! "I didn't know vanilla made such a difference."